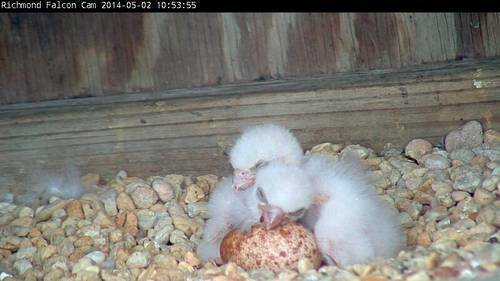 Given the relatively high degree of synchronicity in the hatching of peregrine falcon eggs, we had expected the third egg of the clutch to hatch by the morning of May 3rd. This did not happen, and it is now clear that this egg will not hatch. The pair may continue to incubate the egg for some time while they brood the chicks for the next week and a half or so. Eventually the egg will be ignored. A host of factors, including infertility, weather, and contaminants may have resulted in this egg being ‘addled’. 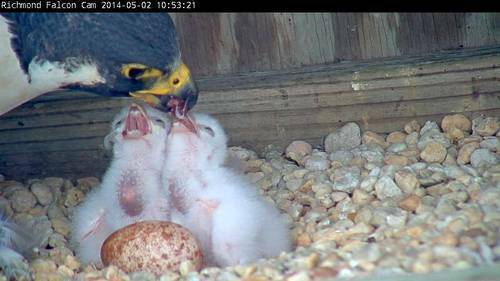 The chicks appear healthy and continue to grow as they are fed regularly. For the first several days after hatching, peregrine chicks have fairly poor eyesight and respond primarily to adult vocalizations. As their sight improves between 4 and 8 days, the nestlings will begin to distinguish and react by sight to the adults. Behaviors such as preening, scratching, and stretching will begin after the first week, although the chicks will spend most of their time sleeping for the first 2 weeks.